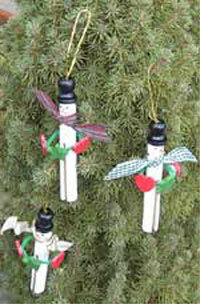 A clothespin snowman is so easy to make and are cute characters for your Christmas tree. You can use them for any place in the house that you want to bring the Christmas spirit to. They look really cute on your mantel with greenery that you have placed there. Just tuck them in anywhere that you want to add that something extra. These little fellows are a very friendly sight! All you need to make them are clothespins, wood spool, toothpicks for the noses and chenille stems for their arms. This is a great kids craft. They are easy to make and the kids love to make them and they can give them as gifts. There are many crafts for Christmas and this one is really cute because they are very different and everyone loves them. Paint the clothespin white, star cutouts green, heart red, and spool and circle black. For the nose, paint the ends of the toothpick orange. Cut the painted toothpick about ¼” long and glue it to the face. Paint black eyes and a black mouth. You can paint black buttons on the snowman if you want. For the arms, overlap ends of chenille stem ½” and glue together to form a loop. Glue the overlap at back of neck for the arms of the clothespin snowman. Glue star and heart cutouts to front of arms. Cut 5 ½” of ribbon and knot scarf around the neck. For the hat, glue spool to center of circle cutout and glue the hat to the head. For the hanger, glue a thin piece of ribbon or cord in the hole at the top of the spool. You will want to make a lot of these because you can put them anywhere to decorate the house.